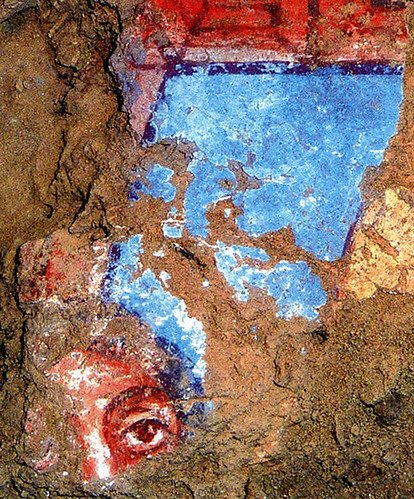 Experts say that a strikingly vivid colored mural found in southern Uzbekistan, dated to the second or third century CE, provides an interesting glimpse into the spread and the development of early Buddhism along the ancient Silk Road. 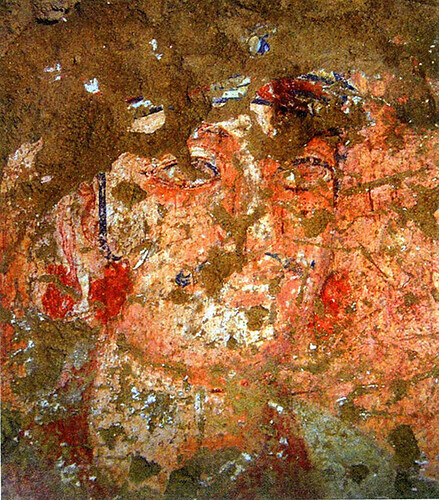 The mural was discovered in 2016 in a stone room located two meters underground next to a pagoda, during an archeological dig by a team of local researchers from the Uzbek Academy of Sciences and researchers from Rissho University—one of Japan’s oldest universities located in Tokyo, originally founded in 1580 as a learning center for young monks of the Nichiren School of Mahayana Buddhism—at the Kara Tepe archeological site in a suburb of Termez. Images of the mural have recently been released to the public with consent of the Uzbek Academy of Sciences Fine Arts Institute. 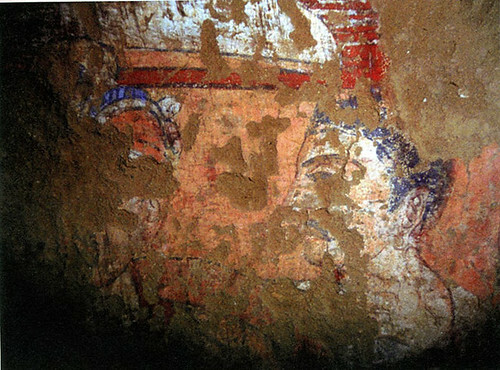 The wall painting, which measures one meter in width and one meter in length, features a number of figures in bright hues of red and blue. According to Haruki Yasuda, art history professor of art history at Rissho University’s Faculty of Buddhist Studies, the mural might have been part of a larger work that once depicted the life of the Buddha. The city of Termez, also the hottest point in Uzbekistan, is located close to the border of Afghanistan and to the Bamiyan valley in Afghanistan, the site where the Bamiyan Buddha statues stood before they were destroyed by Taliban forces in 2001. It was once located on a crossroads of civilizations on the Silk Road, much like the archeological site of Dunhuang in Gansu Province, China, known for its murals. In addition to the Buddhist mural (the first one of its kind to be found at the Kara Tepe site), other important finds have been made at the site, including Greek- and Roman-style figures and a statue of the head of a Garuda, a large legendary bird in India. The dates of these artifacts are also thought to range between the second and third centuries CE. 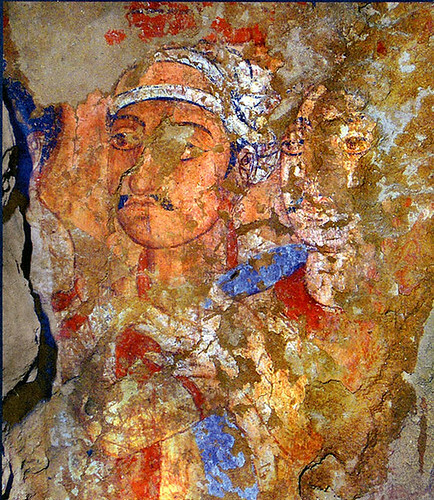 According to Akira Miyaji, professor emeritus of Nagoya University and expert on Buddhist art in Central Asia, the diversity of the art styles present at the site are reflected in the mural, which combines techniques both Eastern- and Western-style paintings, making it a significant find that exemplifies the cross-cultural influences in early Buddhist art. While Buddhism is said to have been originated in India around the fifth century BCE, it travelled in a clock wise direction through Northwest Asia, before reaching, China, Korea, and Japan, approximately 1,000 years later. In recent years, significant findings have started to unearth some of the early Buddhist diaspora in Northwest Asia, most notably in present day Afghanistan, Pakistan, and now also Uzbekistan. While at present, less than one percent of the Uzbek population practices Buddhism according to the Uzbek government, parts of present day Uzbekistan used to be part of the Kushan Empire (30–375 CE), which, despite the lack of written records, was a key player between Augustan Rome and Imperial China that facilitated the spread of Buddhist missionaries, merchants, and scriptures along the overland Silk Roads from Central Asia into East Asia.